Birdwatching is a very rewarding hobby to pursue, as many may already know. According to the Iowa DNR, some 750,000 people in Iowa alone enjoy the hobby. It can be a very calming time in someone's busy, hectic schedule to sit and watch the beautiful birds flitter to and from your bird feeders and houses. Unfortunately, as winter looms over us, you see some of these bird species disappear for warmer climates. However, quite a few birds remain for the cold months, so you shouldn't put your hobby on hold! In fact, autumn and winter may be the most important time of all to offer food, water, and shelter to your feathered guests when these things are the most scarce for them. If you're really lucky, you might even see a bald eagle soaring above if you live in an open but wooded area! So, what sorts of seed should you buy for the winter months that will best maintain the health of your backyard neighbors? You'll find all of the below listed nuts and seeds right here at Norby's Farm Fleet! Ask any of our employees for assistance in locating them. It's very important for birds to maintain a healthy level of quality fats and oils during the winter, both of which the black oil sunflower seed has. On the plus side for you, it has a longer grain which means it is more filling for the bird, and makes it more cost-efficient for you! Even better, almost all birds that come to a feeder will eat this seed. De-shelled, unsalted, dry-roasted peanuts are another great source of quality fats and oils. They will boost a bird's energy levels during the winter months and provide a great source of protein. Most birds will come to a feeder for this treat, including cardinals, jays, woodpeckers, and chickadees. Another high-fat food for birds. 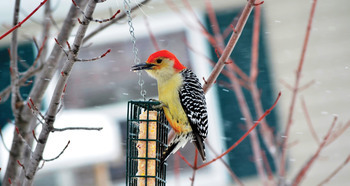 Depending on the specific type of suet you purchase, suet can be the perfect source of fat and energy that your birds need to survive the winter—assuming you can keep it out of reach of the squirrels! If you're feeling ambitious about your hobby, you could even make your very own suet mix tailored specifically to your backyard using any combination of ingredients above. An easy method of doing so is to place a block of suet in your microwave and heat it up until it melts. Pour it into an ice cube tray while it cools down. Before it has completely solidified, add your choice of seeds and nuts. Set the suet cubes in the feeder as per usual, and watch the birds go after it! With all of this in mind, you should be able to attract most types of winter birds! Enjoy the continued company of birds in your backyard through the cold wintery months, and don't forget to stock up on your birdwatching needs right here at Norby's Farm Fleet!